Cloud Computing Services – what does it mean to your business? Shadik Technologies cloud computing services create an environment where our clients have easy access to virtualized and dynamically-scalable computing resources on an as-needed basis. Simply put, our cloud computing services environment provides access to data storage, virtual servers and desktops through to email and mobile device hosting – all on an as-needed basis. All our cloud computing services systems are powered by our own platform and supported by our data center engineers. Our clients gain the benefit of cloud computing services and access to resources in an environment that maintains security and protection for their data. 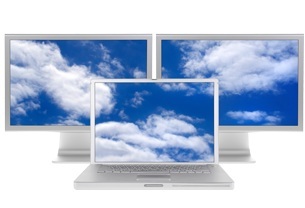 With cloud computing services, the computing capacity is there when you need it. No more waiting on physical resources to be procured and put in place before you can gain access to them. Due to the nature of the private cloud environment, scalability can be easily achieved. Due to the underlying technology, the cloud computing services environment is now decoupled from the physical hardware and can realize the benefits of spreading the computing load over a number of resources in a large, remote server environment. The benefit: if one server fails for any reason, the rest of the server environment is still up and running. For the cloud computing user, scalability doesn’t mean having to invest in costly server capacity that may go unused. Why pay for capacity you’re not using? Private cloud computing services environments allow the user to not only scale the resources they need when they need them but pay for them on an as needed basis. Shadik’s cloud computing services can be subscribed to individually or in conjunction with other services. Our cloud computing services solutions are able to address business requirements that are as simple as backing up remote data from a branch location to replicating data on redundant servers across a wide-area network. Because we utilize the best technology and practices for our cloud computing services, we can offer enterprise-class services to our clients without the initial capital investment. All of our cloud computing services provide client access to proactive and on-site technical management for business continuity and peace of mind.